The Ironman 3000 Inversion Table from Ironman fitness is one of the best selling inversion tables on the market. If you have not heard of it then it may be because its recently be re branded from the popular Ironman 5800 model. If you are here looking for the 5800 model then you have found it! 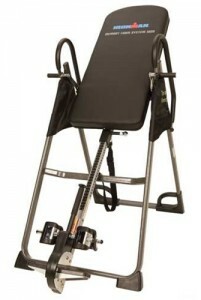 1 Read our full review of the Ironman 3000 Inversion Table. 5 What are other reviews saying about the Ironman 3000? Read our full review of the Ironman 3000 Inversion Table. For a good quality Invertion Table the Ironman 3000 really ticks the box. We like the cheaper Innova Ftiness ITX9600, however the extra investment really tells, the Ironman feels more durable and gives increased confidence when being used. The last thing you want when hanging upside down is worrying about how cheap the bolts are! For us spending about $200 is probably about as low as you would want to go for the reassurance it brings. Having just touched on this its worth exploring the build quality a little more. That extra spend over lower cost tables can be found in the higher thickness of steel and overall quality of the components that goes into this Inversion Table. It’s fair to say that the Ironman inversion table lives up to its name! If you are familiar with the Ironman films, this looks more like the first prototype model. It might look a little crude, but its very strong and rock solid. 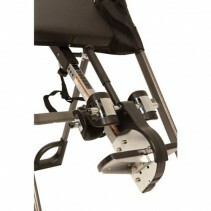 We have separated out the foot attachment here, its an important part of the Inversion Table, as its where you are physically connected, and most stress is caused. On the Ironman 3000 your feet are attached the table through a ratchet system that you can quickly and easily control to apply just the right amount of pressure to your ankles. Not enough to cut off the blood flow, yet firm enough to hold you securely. Even if you are bigger the ankle supports are still excellent, we have heard of people with upto size 14 feet using this table quite successfully. This table can be used to treat a number of ailments, including Back Pain, Fatigue and poor Circulation. The attached pivot arm makes removal tricky. You will need to have space to keep this stored fully assembled. What are other reviews saying about the Ironman 3000? The Ironman 3000 scores a thumping 4.6 on Amazon, from a staggering 200+ reviews. This is one of the highest ratings we have seen for inversion tables. If you are looking for peace of mind then over 200 people can’t be wrong. When compiling this Ironman Fitness 3000 Inversion Table review we found that it was actually hard to find a huge discount on this machine. Unlike many fitness companies they have not marked up this machine to then discount all the time. At just a shade over $200 this represents excellent value for money.